In remembering the murder of the Jews during the period of National Socialism in Germany, the contribution made by artists in the first twenty years after the end of the war has been largely ignored. But how did artists deal with their own experiences and relate these to what they saw, heard and read about the Holocaust? What images of the Jews were presented to the Germans after the end of the brutal regime? And did works of art in Germany contribute to a re-education process, new ways of thinking in both East and West Germany, and the culture of memory? Judenmord is the first collection of works of art specifically by German artists from the end of the war to the end of the 1960s that comment on the Holocaust. It presents paintings, drawings and etchings that bring to light the persecution of the Jews, and examines how artists reacted to injustice in a social situation where the majority stayed silent. 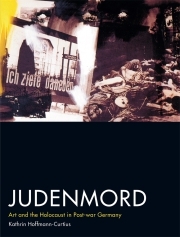 Featuring an unfamiliar array of works, by artists such as Otto Pankok, Lea Grundig, Ludwig Meidner, Werner Tübke, Wolf Vostell, Joseph Beuys and Gerhard Richter, and including those by former camp inmates, this is essential reading for all those interested in the history of art and the Holocaust. Kathrin Hoffmann-Curtius is an independent art historian based in Berlin.